I had planned to make an exception this week and post a project that would not involve the use of the bird punch, but then I got quite a surprise. I just couldn’t believe it when my Heliconia card was selected for this past week’s featured upload for Splitcoaststampers Stampin’ Up! gallery. Wow! I never expected anything like that to happen! All of a sudden my blog received a welcome avalanche of new visitors interested in seeing different ways to use this punch. I wanted to make it really worth everybody’s time by showing yet another way to use it, and was hoping to post this card earlier, but my days have just been too long and full. 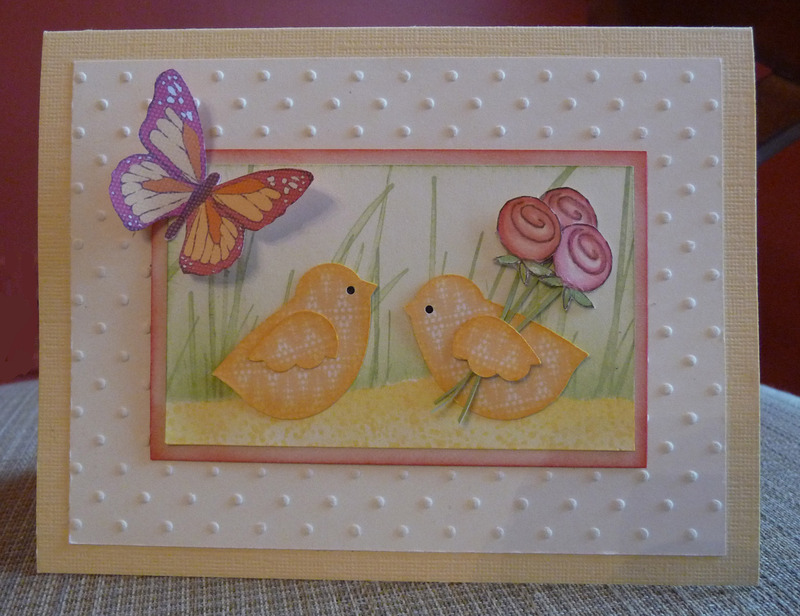 Unlike those cuties on my card I’m no Spring chicken, and by the time I could finally sit down and get some stamping done, all I could think of was to hit the pillow. Well, at least I did manage to get it all done a few days before Easter, and the chicks are so easy to make. Of all the different ways I have used the bird punch, this is the easiest and quickest. So here are all the details and instructions. Accessories: XL 2-step bird punch, 1/16” handheld circle punch, scallop oval punch (optional), sponges, blender pen, Perfect Polka Dots embossing folder, mini blue dots. The background was stamped on a 2-1/8” x 3-1/2” piece of Very Vanilla, using sponges and the masking technique. 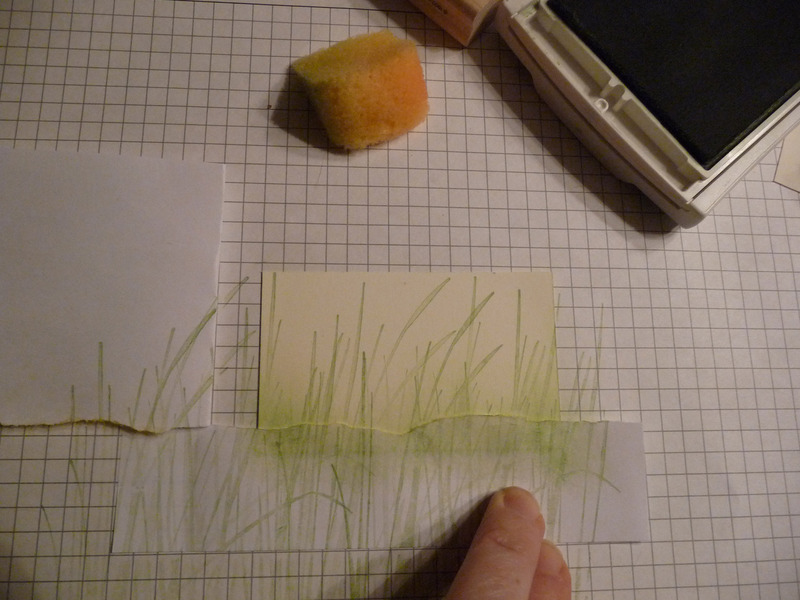 The grass is from Inspired by Nature, and the ‘sand grains’ are from one of the Itty Bitty Background stamps. The pink mat is a 2-3/8” x 3-3/4” piece of Blush Blossom that was sponged with Rose Regal. The embossed mat is 5” x 3-3/4” Very Vanilla. The chicks were punched out of one of the Sweet Pea designer papers and sponged in Barely Banana. The flowers were stamped in Basic Brown on Very Vanilla card stock, then colored with a blender pen using Blush Blossom, Pretty in Pink, then Rose Regal. The stems are Certainly Celery and cut by hand. The butterfly was cut out of one of the Sweet Pea designer papers. –I just want to point out that I used the digital download version of the Sweet Pea designer papers, and used My Digital Studio to print just the size or portion of the paper I needed for the chicks and the butterfly –. 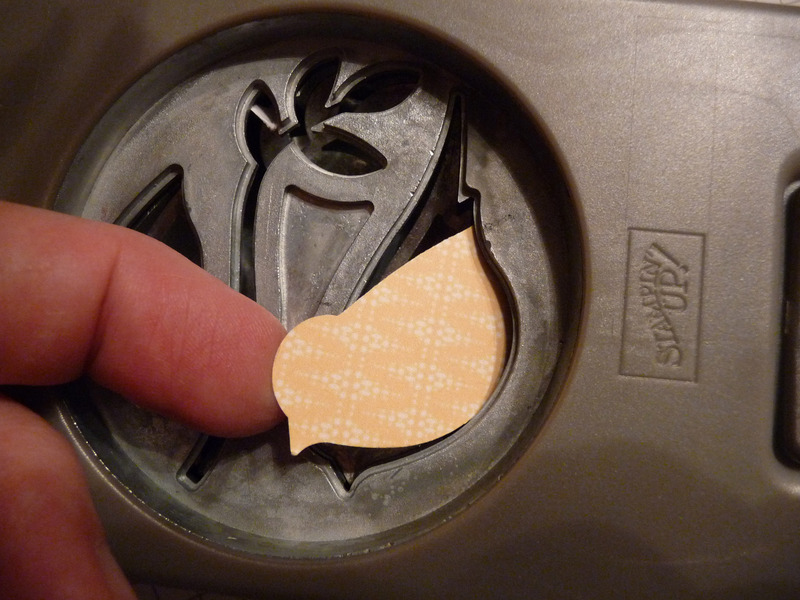 After punching the body, insert it through the body hole of the punch as shown below. Position it so you get a nice round little belly and just a hint of a tail. If it doesn’t come out perfect, don’t forget the sanding block! After punching the wing, insert it through the hole of the Scallop Oval punch as shown below. 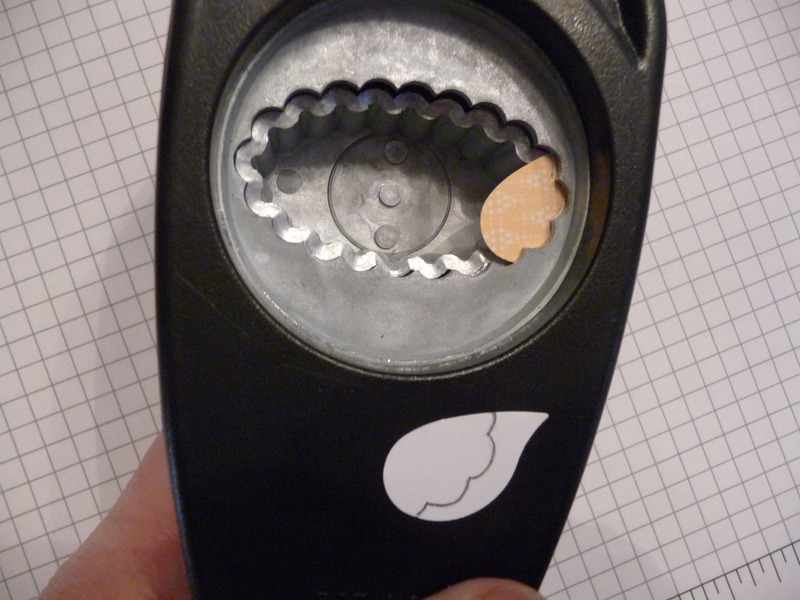 If you do not own this punch, just cut the wing in a wavy manner with your scissors. It doesn’t have to be perfect little scallops. Snip off just a small part of the beak, making it a little smaller. Sponge with Barely Banana. Punch a hole for the eye with the 1/16” handheld circle punch, then glue a small piece of black card stock right behind that hole. Now adhere the wing with a mini glue dot, and your chick is ready to adorn a card! 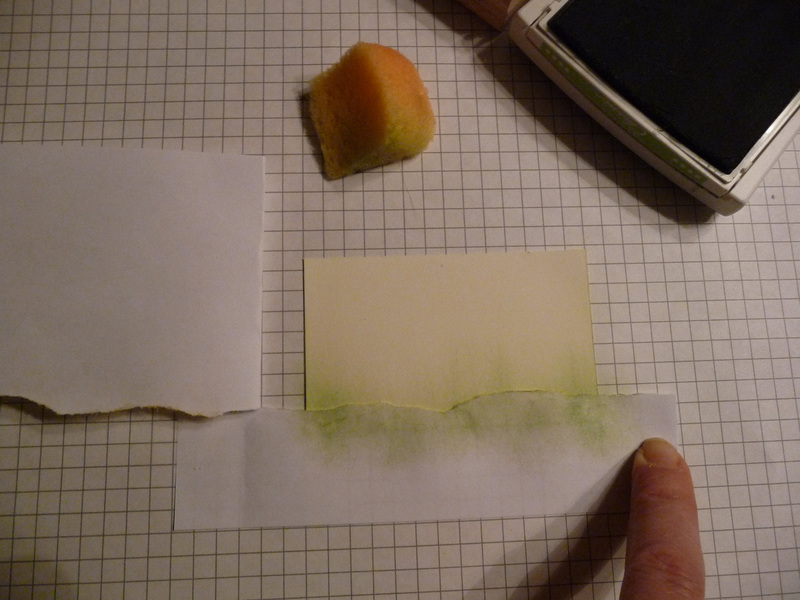 Cut a sheet of paper at least 3″ larger and wider than your piece of card stock. Tear it but not all the way across, keeping a margin that you will use to secure this two-part mask to your work surface. Put a bit of temporary adhesive on the back of your piece of card stock and secure it onto your grid paper. Position your ‘mask’ so that the tear is exactly where you want the cut-off between the ground and the tall grass, and secure it with a piece of tape. 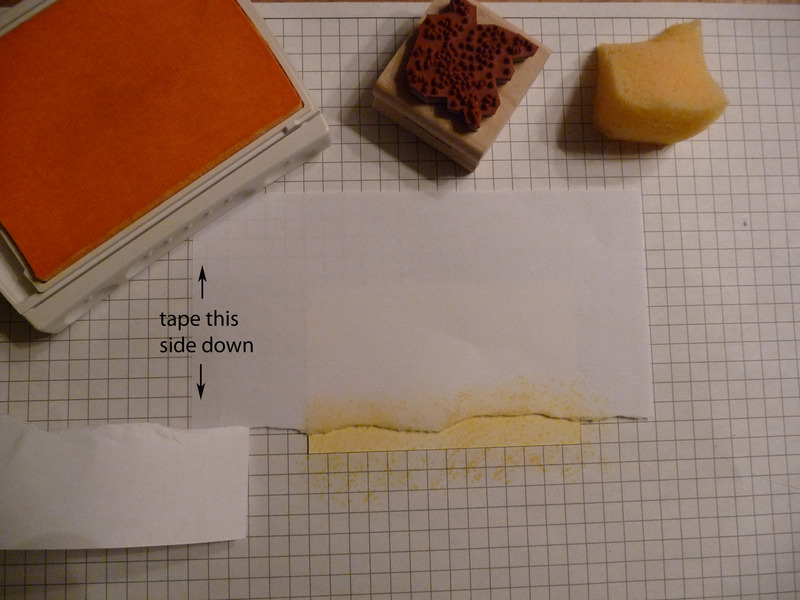 Fold the bottom flap back, as shown below, then sponge and stamp. Then fold back the top flap of the mask and place the bottom flap over the stamped section. Move your piece of card stock up slightly till you see just a hairline of the stamped section — if you omit this you will have a gap between the 2 sections. Now sponge and stamp as shown in the following two photos. Thanks so much for your interest in my projects. Hope you liked this one… more coming soon. This entry was posted in Punches on March 28, 2010 by Ann. Just found your blog and I love it. The easter chicks are so cute!! I will have to add you to my favorite list and will have to check older posts to see what I have been missing!!!!!!! Thanks so much. Oh, I love this…..I have found the Easter card I have been searching for…thank you sooooo much for the ideas. thanks for the many great punch ideas. You will be featured on my punch inspiration blog post tomorrow. I have brought the bird punch, but untouched, now I find your way to use this punch, motivate me to get start, thank you for your very special chick out of the punch, wonderful idea. I found your blog by way of Patti – the little chicks are wonderful! Allof your work is! You are so creative and have so many great projects! Wow im impressed these wee chicks are so cute I will probably have to get the punch just to make them! Ann, you are just amazing and i am in awe of your creativity. I loved my bird punch when I could just punch out bird pieces and put them together, but to come up with so many different cards from one punch is just wonderful. Thank you for sharing your talents with us. Ann, I am thrilled to receive your E-mails and absolutely amazed that you have the vision to imagine what these little punches can do…truly a gift. It is such a pleasure to work behind you…your instructions are so clear. Thank you so much for sharing. We are fortunate to have you in our midst. Thanks for your very kind comments, Bonnie. I’m really having fun working on these projects and sharing them with all of you, but what really thrills me is reading the comments. Knowing that what I do is appreciated makes it all so much more worthwhile. You made my day! This is really lovely and gives me new ideas and ways of using this punch. Thanks. Your projects are absolutely AWESOME. Thanks for sharing. This card is just too cute!! Thanks so much for sharing the turorial. Another amazing use of this punch. You are soooo creative. Thanks for another wonderful tutorial. I see chicks in my near future. Thanks so much. Cute, cute, cute! First chick from the bird punch I’ve seen. Thanks for sharing. Your designs with the punches inspire me to take a second look at using punches in new ways – love your detail and your instructions are super great. Look forward to future postings, and thanks so much for sharing. I just found your blog and boy am I thrilled. Your work is breathe taking. Those birds are perfect. I am now a follower. Great job and thanks for inspiring me. Another great creation using punches. I just love your work Ann and am so inspired by it! Thank you for showing how to make little chicks!! Beautiful card! OMG Ann…..your chicks are adorable. Congratulations too on being the SCS featured upload of the week. Way cool!!!! how cute it that !! i love all your creations you are very talented! Valita ps pop over to my blog and check out some of my stuff…have a great day! Valita, I visited your blog and I’m in total awe! So much creativity and talent there. I left a couple of comments. Love your retro tulips, the altered teabag scallop flower, and the tulips with the oval punches. I think I’ll have to sign up to make sure I don’t miss a thing! These are so adorable!!! Thanks for showing how to make them. I’m going to make some today. They are too cute to resist! In compliance with Stampin' Up! regulations, the following message must appear on my blog: This content is my sole responsibility as an independent Stampin' Up! demonstrator and the use of and content of the classes, services, or products offered here is not endorsed by Stampin' Up!